Hi all! How has your Saturday been so far? I'm extremely exhausted (for some dumb reason) cos' today, I brought Sophia to an indoor playground at Great World City. 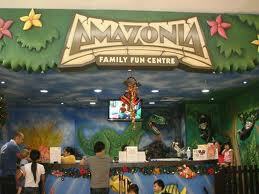 Amazonia is located at 3rd floor of Great World City, diagonally opposite the movie ticketing area. It's a very organised centre, and pretty good size for an indoor playground. There's a bistro right in front of the play area and it's all within sight for parents. The moment I step into the play area, I'm wowed by the crowd (not too overcrowded) and the cleanliness. They have specific areas for kids below 3 years of age, and another play area for the older ones. It's well organised and the bistro staffs are very friendly. I really like Amazonia and I will bring Sophia back there cos' she really loved it. As a matter of fact, she kinda whined and cried when we had to go... I'll put the link here and go check out the place and pricing! I used to not enjoy shopping but after marriage and baby, I will buy myself and Sophia something every month, within a budget I set aside for that month. This month, I bought myself some stuff (well, actually, only one item was sponsored by the hubby as my Mothers' Day gift).. Guess where did I go? How can I ever resist you? So being the cheapo mother I am, I will only spend on something less than 20 bucks per item. U have to really try to minimize your expenditure, and I actually bought 3 things that I needed cos I ran out of my own! I finally got my hands on MUFE HD Foundation! Been wanting this for a long time but the price is the KILLER. I will be trying this foundation soon! I used the towelettes and the eye make-up remover to remove my eye make-up and clean my face. I like it, so far.. yet to see good results. 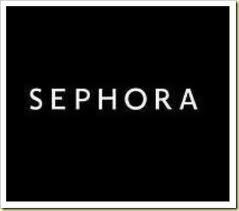 I will write a review on all my purchases at Sephora today. Overall, I had a pretty good day, except Sophia misbehaved a little outside and I dragged her home early. She's now doing her colouring in the living room as she's punished with no television till tomorrow. Well, she understood (i hope) what she had done wrong, eventhough she wailed her lungs out when I refused to let her watch television. Sometimes, they gotta learn the hard way! Alrighty! Have a great weekend!